This beautiful floral Opal necklace features a "colour changing" beautiful solid Ethiopia Wello crystal Opal with green, orange and yellow rolling flashes in a Stirling silver finding. The gemstone is decorated with a floral design using handmade sterling silver leaves, flower motif and a Swarovski AB crystal bead for extra sparkle. 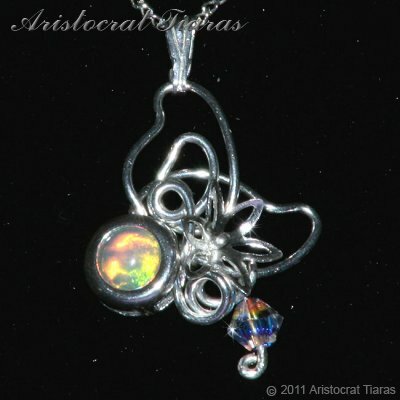 This handmade necklace from Aristocrat Tiaras is part of our Opal jewellery collection for one special mother of the bride or lady to enhance her outfit or makes a attactive gift for any special occasion! Please note: the Ethiopia Wello opal is hand cut from a raw natural stone and polished in UK. This is one off gemstone and is unique, the pendant shown is the actual item for sale and the gemstone can not be duplicated.